While something no doubt unspeakable has happened to J (we don’t know either—tweet your most creative theories to us @Podwits! ), Dion and Brian are talking music (and linguistic history, and The Walking Dead, but mostly music). The boys discuss Black Sabbath, the Doors, the joys of shows at small venues, and how they don’t always make ’em like they used to. 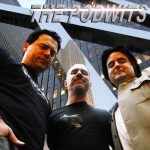 Pull on your concert tee and prepare to rock out with this brand new Podwits Podcast!